Pairing older elementary students with younger ones for community reading time has benefits for both groups. Peer mentoring is a powerful, underused tool in schools. One study suggests that partnering with higher achieving peers can have a positive influence on a student’s learning, and students who are older, more capable readers can be these peers for young students. With this in mind, I have used a practice called Reading Buddies in elementary schools to great effect. Reading Buddies is a concept that pairs different grade-level classrooms for community reading time—an upper-grade classroom connects with a lower-grade one, and students partner for time with books. The structure is simple: Pair upper-grade classes with lower-grade ones. Ideally, in a pre-K through fifth grade elementary school, third graders pair with prekindergartners or kindergartners, fourth graders with first graders, and fifth graders with second graders. It’s best to have students work in pairs, but groups of three are fine as well. Set aside at least one 30-minute session per month for the students to read together. Gather the students in a classroom, the library, the cafeteria, or even outside on a sunny afternoon. Let the younger students pick the books at first so they get hooked with an interesting read. Later you can have the older students share some of their favorites. As the year progresses and the skills of the younger readers increase, you can have the students take turns reading to each other, giving everyone a chance to show off. The benefits are profound. 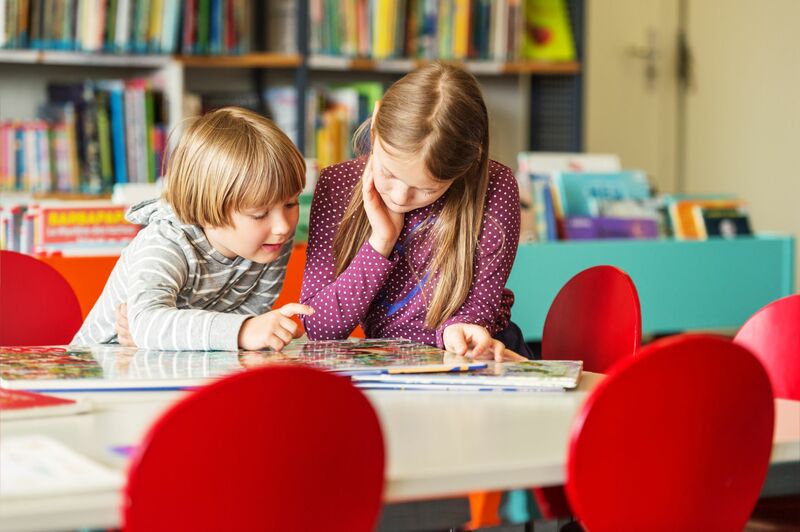 Reading Buddies allows younger readers to see what being fluent looks like as they have a peer model demonstrating reading skills; they can also acquire a positive role model with some intentional pairing. The older students develop social and emotional skills like patience and empathy as they work with their littler buddies. Additionally, for upper elementary students who are struggling with grade-level reading, the opportunity to access easier reading material without stigma or shame while sharing with a novice reader can create a positive experience with an activity that may otherwise be less than enjoyable. And the roots of the school community deepen as classes across campus work and share together. Get the best of Edutopia in your inbox each week. You might be worried about the reading level or the behavior of the older students, for good reason. But this opportunity could be just what they need: When students are given the freedom to be better, to work for something bigger than themselves, and to mentor others, they can thrive. Those who are not reading on grade level will have a chance to practice with picture books that they wouldn’t otherwise pick up and to increase their confidence as they read to a mesmerized kindergartner. I’ve seen this success for students with behavior difficulties. Let me tell you about a student I’ll call Marcus, a fifth grader with attention issues who read at a first-grade level and was often in trouble, but who had an amazing heart. His teacher, who was justifiably worried about his progress, partnered with a kindergarten class for Reading Buddies. Marcus was paired with Tony, a little guy with his own set of difficulties, such as defiance, use of profanity, and physical aggression. They got on fine, but the relationship didn’t blossom until after a few sessions. While walking to meet the kinder class, Marcus saw Tony talking to his teacher outside the classroom and being less than respectful. When Tony belatedly made it to Reading Buddies, Marcus put his arm around him and began to mentor him. Marcus gave him the old “Don’t be like me, kid” speech. Tony looked at Marcus with an expression of embarrassment and respect for someone who had had similar difficulties through the years. Over time, the teachers worked out an intervention where Marcus could go spend time with Tony outside of Reading Buddies both as a reward and as an intervention when Tony’s day started getting hard. As part of a token reward system, Tony could request that Marcus join him for lunch or recess. For the intervention, Marcus would sometimes come down to the kinder classroom to give Tony a pep talk. This was a positive relationship for both students as Tony had a role model and Marcus had someone to mentor, which helped him grow. This program of cooperative learning is a great way to build community in the school and to promote reading, which are goals for nearly every school. Both sets of students get excited about Reading Buddies time because it’s a chance to get out of class, have fun, and make a friend. I’ve seen kindergarten and first grade classes deliver letters of encouragement to their partners before the scary state assessments. With thoughtfulness, the relationships can extend beyond just one school year and carry over beyond reading books. Powerful moments of connection can happen, and social and emotional lessons are inevitable. These are some wonderful outcomes, all from just sharing a book. ©2019 George Lucas Educational Foundation. All Rights Reserved. Edutopia® and Lucas Education Research™ are trademarks or registered trademarks of the George Lucas Educational Foundation in the U.S. and other countries.